Just as he demystified the soil food web in his groundbreaking book Teaming with Microbes, in this new work Jeff Lowenfels explains the basics of plant nutrition from an organic gardener’s perspective. Most gardeners realize that plants need to be fed but know little or nothing about the nature of the nutrients and the mechanisms involved. In his trademark down-to-earth style, Lowenfels explains the role of both macronutrients and micronutrients and shows gardeners how to provide these easy essentials through organic, easy-to-follow techniques. 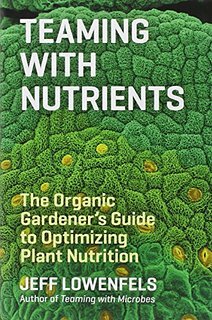 Along the way, Lowenfels gives the reader easy-to-grasp lessons in the biology, chemistry, and botany needed to understand how nutrients get into the plant and what they do once they’re inside. (Don’t worry: you won’t have to learn college-level science). Teaming with Nutrients will make you a better informed, more successful, more environmentally responsible gardener and will give you a new appreciation for the plants you grow.